Eric Dane playing his tournament size set. Orders on average are taking longer than usual, so if you are in a rush, don't order. I'm doing my best to get them out the door without jeopardizing the quality. Thanks! 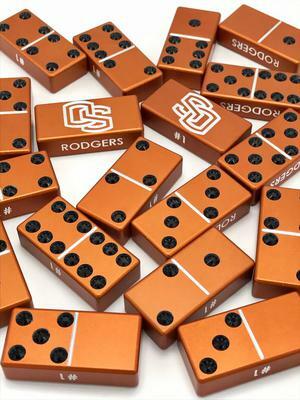 Welcome to the most exclusive producer of custom dominoes designed by myself, Ronnie Rosales. 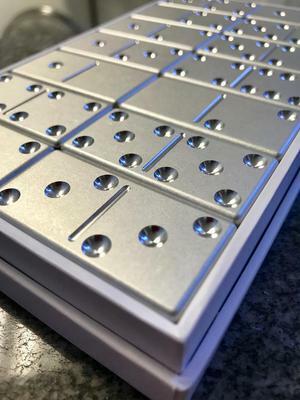 Machined from solid aircraft quality aluminum and anodized to protect the dominoes from corroding or scratching. This custom engraved set will last you a very long time. Featured in Men's Health and Men's Journal twice. Established in 2001. 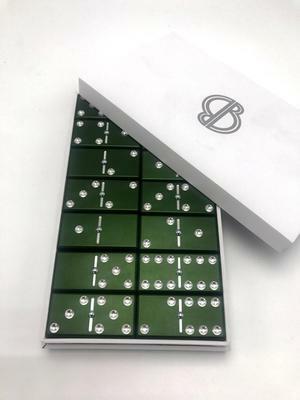 Unbreakable, elegant, luxurious, exotic and modern, every domino is taken through a step by step process to ensure every dominoes finish is flawless. 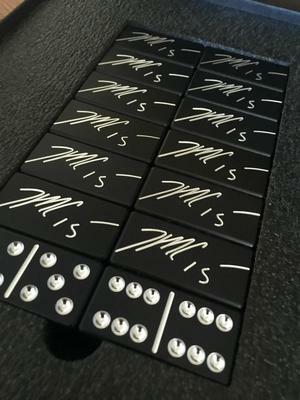 My personalized modern dominoes are individually engraved with a cutter that cuts into the surface, usually .003 thousands of an inch deep, so that the initials never fade or wear over time so they last from generation to generation. 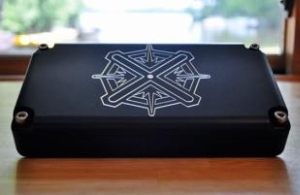 Unlike laser engraving or silk screen where it etches or paints the surface only. Email me for a quote if you have a font besides the fonts I have on my fonts tab. 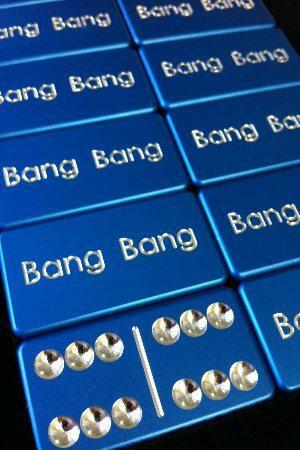 I can take your signature and duplicate it on the backs of double 6, 9 or double 12 domino sets or engrave the blank domino. 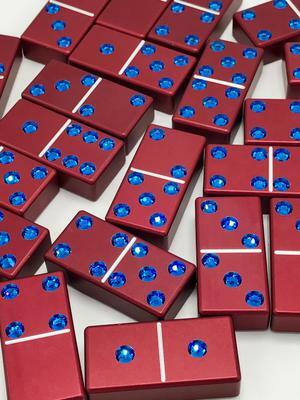 Since my luxury dominoes are custom made, make sure you give me enough time to craft them. If you have any questions, I am a quick phone call, text or email away from any suggestions or concerns you might have. I can even email samples of certain fonts so you can see what it will look like before I engrave. 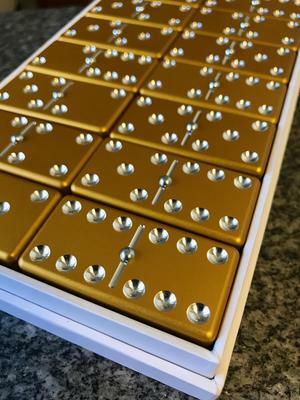 I take pride that I am the original custom domino manufacturer of fine exotic, modern metal dominoes. 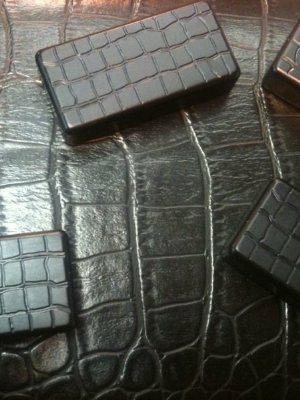 My new designer sets include studded domino sets, alligator dominoes, and the hardest set to ever be made. 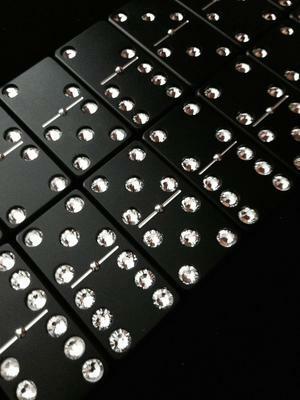 Black Type III hard anodized dominoes! Thicker, stronger and tougher! For the serious players who are rough with dominoes, and like to slam them down hard! 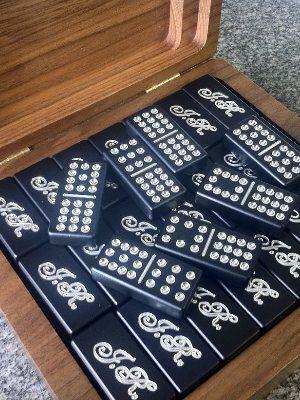 Whether they are purchased as a birthday gift, heirloom set, corporate gifts, or for your best man, you can guarantee that these custom dominoes will win over anyone! Bone up and step up the experience of the game! You will never find a more unique and thoughtful gift. All deluxe dominoes are 1 x 2 x 1/2 inch thick. 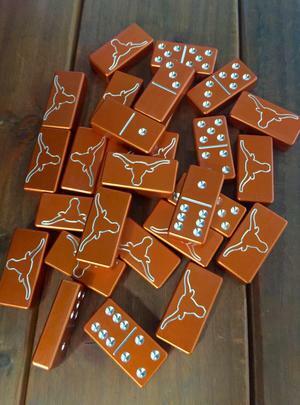 Tournament size dominoes are 1/8th longer and wider. They will stand up on their own without racks! *Concrete tables and any other rough surfaces will mar and scratch domino surface. Only play on wood or soft surfaces like plastic, cloth. Hard shuffling can sometimes fade the edges. Also, if you are in a severe rush please email me. Sometimes I can produce them quickly or have them in stock. More than likely it might take up to 1 to 2 months. Subscribe to our mailing list for coupon codes! Miami Herald mention of Billet Bones in Miami! 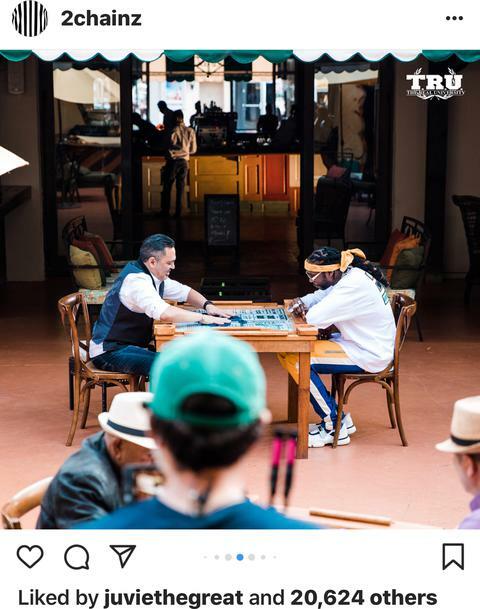 Your's truly is sitting with 2 Chainz. 2Chainz purple Dredge God Set that will be on second season of The Most Expensivenest on Viceland. Sign in to your cable account to view episode on Viceland. Celebrity customers include, Trevor Ariza, Paul Pierce, Mike Meldman (Casamigos Tequila) Eric Dane (Grey's Anatomy), Chris Paul, DeMarcus Cousins, Reggie Miller, The Dallas Mavericks Champs of 2011 gifted by Caron Butler, Terius "Juvenile" Grey, Ben Wallace, Jason Kidd, Gary Payton, Michael Beasley, Albert Pujos, Dennis Northcutt, and El Duque Hernandez. Top notch custom domino tables. Click to see info. 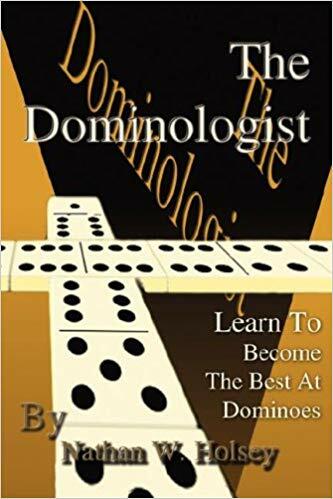 This book is guaranteed to elevate your game! Click on image to order it.